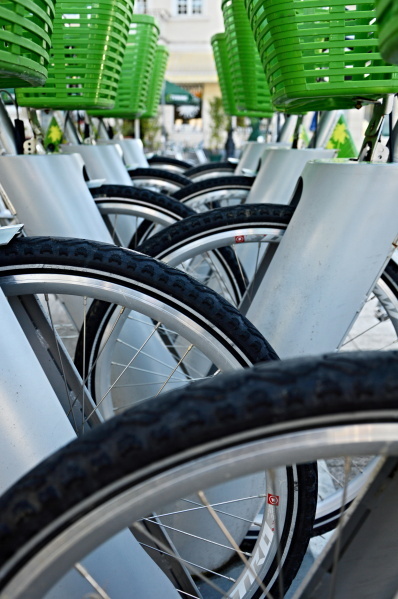 Shot for the Day – Batumi Rental Bikes | Aren't We All Just Tourists Here? Bicycles.. what a wonderful way to explore a city.. especially when they have these pretty green baskets. The rental bikes in Batumi, Georgia all have these bright green baskets which make carrying your stuff from place to place alot easier..
Bikes are available from vendors along the beach and from the automated system BatumiVelo.. You can buy an automated card for the machines from the Tourist info centers.. The card is rechargeable with a minimum of 20 lari.. The bike paths are painted red and cover most of the city..but one of the prettiest is the 8km stretch along the beach to the Batumi Port.. This entry was posted in Photography, Travel and tagged Batumi, Bicycles, bikes, Georgia, green, Photography, rental, Travel by Steven. Bookmark the permalink. Great shots – you are right, there is no better way to see a place than on a bicycle.